I have been a stranger in a strange land. 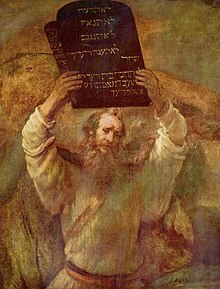 Moses מֹשֶׁה (Móshe Standard Hebrew, Mōšeh Tiberian Hebrew, موسى Mūsa Arabic) is figure appearing in the Pentateuch as the Hebrew liberator, leader, lawgiver, and prophet. They shall say to me, What is his name? what shall I say unto them? Quotations of Moses from the book Exodus (שמות, Shemot: "Names") from the Torah (תּוֹרָה) of the Jewish and Christian scriptures. A sojourner have I become in a foreign land. I have been a stranger in a foreign land. I will now turn aside, and see this great sight, why the bush is not burnt. Who am I, that I should go unto Pharaoh, and that I should bring forth the children of Israel out of Egypt? Behold, when I come unto the children of Israel, and shall say unto them, The God of your fathers hath sent me unto you; and they shall say to me, What is his name? what shall I say unto them? Thus shalt thou say unto the children of Israel, I AM hath sent me unto you. Thus shalt thou say unto the children of Israel, the LORD God of your fathers, the God of Abraham, the God of Isaac, and the God of Jacob, hath sent me unto you: this is my name for ever, and this is my memorial unto all generations. But for this very reason I have kept you in existence: to show you my power and to have my name declared in all the earth. O my LORD, I am not eloquent, neither heretofore, nor since thou hast spoken unto thy servant: but I am slow of speech, and of a slow tongue. Jehovah will rule as king forever and ever. I pray thee, if I have found grace in thy sight, shew me now thy way, that I may know thee, that I may find grace in thy sight: and consider that this nation is thy people. And Moses cried unto the LORD, saying: 'Heal her now, O God, I beseech Thee. Behold, I have set the land before you: go in and possess the land which the LORD sware unto your fathers, Abraham, Isaac, and Jacob, to give unto them and to their seed after them. And I spake unto you at that time, saying, I am not able to bear you myself alone: The LORD your God hath multiplied you, and, behold, ye are this day as the stars of heaven for multitude. How can I myself alone bear your cumbrance, and your burden, and your strife? Take you wise men, and understanding, and known among your tribes, and I will make them rulers over you. And ye answered me, and said, The thing which thou hast spoken is good for us to do. So I took the chief of your tribes, wise men, and known, and made them heads over you, captains over thousands, and captains over hundreds, and captains over fifties, and captains over tens, and officers among your tribes. And I charged your judges at that time, saying, Hear the causes between your brethren, and judge righteously between every man and his brother, and the stranger that is with him. Ye shall not respect persons in judgment; but ye shall hear the small as well as the great; ye shall not be afraid of the face of man; for the judgment is God's: and the cause that is too hard for you, bring it unto me, and I will hear it. And I commanded you at that time all the things which ye should do. Ask now of the days that are past which were before thee, since the day God created man upon earth. You yourselves have been shown these things so you will know that Jehovah is the true God; there is no other besides him. Know, therefore, on this day, and take it to heart that Jehovah is the true God in the heavens above and on the earth beneath. There is no other. Quotations of Moses from the Book of Moses from the Pearl of Great Price of The Church of Jesus Christ of Latter-day Saints scriptures. But now mine own eyes have beheld God; but not my natural, but my spiritual eyes, for my natural eyes could not have beheld; for I should have withered and died in his presence; but his glory was upon me; and I beheld his face, for I was transfigured before him. As long as you will have a feeling of shame, you will not lightly commit sins. God gave you the Torah and wrought marvels for you, in order, through this and through the observances of the laws which He imposed upon you, to distinguish you before all other nations on earth. Consider, however, that whereas up to this time you have been ignorant, and your ignorance served as your excuse, you now know exactly what to do and what not to do. Until now you did not know that the righteous are to be rewarded and the godless to be punished in the future world, but now you know it. But as long as you will have a feeling of shame, you will not lightly commit sins. Louis Ginzberg, Moses Chosen as Intermediator, Chapter II, "The Legend of the Jews"
In the last heaven Moses saw two angels, each five hundred parasangs in height, forged out of chains of black fire and red fire, the angels Af, "Anger," and Hemah, "Wrath," whom God created at the beginning of the world, to execute His will. Moses was disquieted when he looked upon them, but Metatron embraced him, and said, "Moses, Moses, thou favorite of God, fear not, and be not terrified," and Moses became calm. There was another angel in the seventh heaven, different in appearance from all the others, and of frightful mien. His height was so great, it would have taken five hundred years to cover a distance equal to it, and from the crown of his head to the soles of his feet he was studded with glaring eyes. "This one," said Metatron, addressing Moses, "is Samael, who takes the soul away from man." "Whither goes he now?" asked Moses, and Metatron replied, "To fetch the soul of Job the pious." Thereupon Moses prayed to God in these words, "O may it be Thy will, my God and the God of my fathers, not to let me fall into the hands of this angel." Louis Ginzberg, The Ascension of Moses, Chapter IV, "The Legend of the Jews"
Moses said to him: "May I follow thee, on the footing that thou teach me something of the (Higher) Truth which thou hast been taught?" (The other) said: "Verily thou wilt not be able to have patience with me!" And how canst thou have patience about things about which thy understanding is not complete?" Moses said: "Thou wilt find me, if Allah so will, (truly) patient: nor shall I disobey thee in aught." He said: If you would follow me, then do not question me about any thing until I myself speak to you about it. So they both proceeded: until, when they were in the boat, he scuttled it. Said Moses: "Hast thou scuttled it in order to drown those in it? Truly a strange thing hast thou done!" He answered: "Did I not tell thee that thou canst have no patience with me?" Moses said: "Rebuke me not for forgetting, nor grieve me by raising difficulties in my case." Then they proceeded: until, when they met a young man, he slew him. Moses said: "Hast thou slain an innocent person who had slain none? Truly a foul (unheard of) thing hast thou done!" He answered: "Did I not tell thee that thou canst have no patience with me? (Moses) said: "If ever I ask thee about anything after this, keep me not in thy company: then wouldst thou have received (full) excuse from my side." Then they proceeded: until, when they came to the inhabitants of a town, they asked them for food, but they refused them hospitality. They found there a wall on the point of falling down, but he set it up straight. (Moses) said: "If thou hadst wished, surely thou couldst have exacted some recompense for it!" He answered: "This is the parting between me and thee: now will I tell thee the interpretation of (those things) over which thou wast unable to hold patience. "As for the boat, it belonged to certain men in dire want: they plied on the water: I but wished to render it unserviceable, for there was after them a certain king who seized on every boat by force. "As for the youth, his parents were people of Faith, and we feared that he would grieve them by obstinate rebellion and ingratitude (to Allah and man). So we desired that their Lord would give them in exchange (a son) better in purity (of conduct) and closer in affection. As for the wall, it belonged to two youths, orphans, in the Town; there was, beneath it, a buried treasure, to which they were entitled: their father had been a righteous man: So thy Lord desired that they should attain their age of full strength and get out their treasure - a mercy (and favour) from thy Lord. I did it not of my own accord. Such is the interpretation of (those things) over which thou wast unable to hold patience." Quran, sura 18:66-18:82; as translated by Abdullah Yusuf Ali, Qur'an, the Holy Qur'an: Text, Translation and Commentary, 1939-1940. The supreme law-giver, who received from God that remarkable code upon which the religious, moral, and social life of the nation was so securely founded… [and] one of the greatest human beings with the most decisive leap forward ever discernable in the human story. Winston Churchill (November 8, 1931), "Moses", Sunday Chronicle, National Churchill Museum, Thoughts, 205. And Moses was a hundred and twenty years old when he died: his eye was not dim, nor his natural force abated. … And there has not arisen a prophet since in Israel like Moses, whom the LORD knew face to face, in all the signs and the wonders, which the LORD sent him to do in the land of Egypt to Pharaoh, and to all his servants, and to all his land, and in all that mighty hand, and in all the great terror which Moses shewed in the sight of all Israel. I am firmly convinced that the passionate will for justice and truth has done more to improve man's condition than calculating political shrewdness which in the long run only breeds general distrust. Who can doubt that Moses was a better leader of humanity than Machiavelli? Even the man Moses, the meekest of men, was wrathful sometimes. And she called his name Moses: and she said, Because I drew him out of the water. Who made thee a prince and a judge over us? intendest thou to kill me, as thou killedst the Egyptian? And it came to pass, when Moses came down from mount Sinai with the two tables of testimony in Moses' hand, when he came down from the mount, that Moses wist not that the skin of his face shone while he talked with him. And when Aaron and all the children of Israel saw Moses, behold, the skin of his face shone; and they were afraid to come nigh him. In calling his two sons by the names of Gershom and Eliezer, Moses, like Joseph and other righteous men, intended to have the fact of God's help constantly before him. Since his sons would be with him, and he would often address them or call them by name, he would remember his gratitude to God. 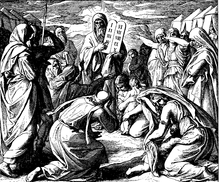 Moses, leading Jethro's flock into the wilderness, was typical of his leading God's flock in the wilderness. Sheltering, feeding, and getting drink for the sheep were the forerunners of his obtaining for Israel the sheltering protection of the pillars of fire and cloud, and a supply of manna, quails, and water in the wilderness. By faith Moses, when he was come to years, refused to be called the son of Pharaoh’s daughter; Choosing rather to suffer affliction with the people of God, than to enjoy the pleasures of sin for a season; Esteeming the reproach of Christ greater riches than the treasures in Egypt: for he had respect unto the recompence of the reward. By faith he forsook Egypt, not fearing the wrath of the king: for he endured, as seeing him who is invisible. The divine authority of Moses and the prophets was admitted, and even established, as the firmest basis of Christianity. Who through deserts and wanderings guided the emigrant nations. Yea, I could even believe I were speaking with Joshua or Moses. Here he had studied and written; here gone through fast and vigil, and come forth half alive; here striven to pray; here borne a hundred thousand agonies! There was the Bible, in its rich old Hebrew, with Moses and the Prophets speaking to him, and God’s voice through all! After the establishment of settled life in Egypt in early times, which took place, according to the mythical account, in the period of the gods and heroes, the first... to persuade the multitudes to use written laws was Mneves [Moses], a man not only great of soul but also in his life the most public-spirited of all lawgivers whose names are recorded. Hecateus of Abdera as quoted by Droge, Arthur J (1989), Homer or Moses? : Early Christian Interpretations of the History of Culture, Mohr Siebeck. The true God may be personated. As He was, first, by Moses, who governed the Israelites, that were not his, but God’s people, not in his own name, with hoc dicit Moses, but in God’s name, with hoc dicit Dominus. The shamir was the seventh of the ten marvels created in the evening twilight of the first Friday (Ab. v. 6; comp. Pes. 54a; Sifre, Deut. 355; Mek., Beshallaḥ, 5 [ed. Weiss, p. 59b; ed. Friedmann, p. 51a]), and it was followed, significantly enough, by the creation of writing, the stylus, and the two tables of stone. Its size was that of a grain of barley; it was created after the six days of creation. Nothing was sufficiently hard to withstand it; when it was placed on stones they split in the manner in which the leaves of a book open; and iron was broken by its mere presence. The shamir was wrapped for preservation in spongy balls of wool and laid in a leaden box filled with barley bran. With the help of this stone Moses engraved the names of the twelve tribes on the breastplate of the high priest, first writing on the stones with ink and then holding the shamir over them, whereupon the writing sank into the stones. Whoever speaks of his own originality is seeking his own glory; but whoever seeks the glory of the one who sent him, this one is true and there is no unrighteousness in him. Moses gave you the Law, did he not? But not one of you obeys the Law. Why are you seeking to kill me?” The crowd answered: “You have a demon. Who is seeking to kill you?” In answer Jesus said to them: “One deed I performed, and you are all surprised. What is this? Eighth and ninth book of Moses. Secret of all secrets. Seal of King David. Whitman, the one man breaking a way ahead. Whitman, the one pioneer. And only Whitman. No English pioneers, no French. . . The same in America. . . Whitman, like a strange, modern, American Moses. Looking first to those who have become Princes by their merit, and not by their good fortune, I say that the most excellent among them were Moses, Cyrus, Romulus, Theseus, and the like … And if their actions and the particular institutions of which they were the authors be studied, they will be found not to differ from those of Moses, instructed though he was by so great a teacher. However weak, foolish, and even criminal parents may be, a child ought to honour them as Moses commanded, for the injunction is, and should be, entirely unconditional. Let us therefore be more considerate builders, more wise in spiritual architecture, when great reformation is expected. For now the time seems come, wherein Moses the great prophet may sit in heaven rejoicing to see that memorable and glorious wish of his fulfilled, when not only our seventy elders, but all the Lord’s people are become prophets. The next remove must be to the study of politics; to know the beginning, end, and reasons of political societies; … After this they are to dive into the ground of law and legal justice; delivered first, and with best warrant by Moses. I do not understand the request of Moses, 'Show me thy glory,' but if he were here . . . after allowing him time to drink the glories of flower, mountain, and sky, I would ask him how they compared with those of the Valley of the Nile . . . and I would inquire how he had the conscience to ask for more glory, when such oceans and atmospheres were about him. Moses, I believe, was too good a judge of such subjects to put his name to that account. He had been educated among The Egyptians, who were a people as well skilled in science, and particularly in astronomy, as any people of their day; and the silence and caution that Moses observes in not authenticating the account, is a good negative evidence that he neither told it nor believed it The case is, that every nation of people has been world-makers, and the Israelites had as much right to set up the trade of world-making as any of the rest; and as Moses was not an Israelite, he might not choose to contradict the tradition.. It has been estimated that one third of our Western civilization bears the mark of its Jewish ancestry. By such doctrine Moses persuaded a large body of right-minded persons to accompany him to the place where Jerusalem now stands..
Tacitus, The Histories, Volume 2, Book V. Chapters 5, 6 p. 208. After supper she got out her book and learned me about Moses and the Bulrushers, and I was in a sweat to find out all about him; but by and by she let it out that Moses had been dead a considerable long time; so then I didn't care no more about him because I don't take no stock in dead people. Juan Valera, Pepita Jimenez (1874), "May 7th"
"Difficult Texts" by Bonna Devora Haberman. How do we study difficult Jewish texts without apologizing for, justifying, or historicizing them?